RINGO VALVULAS, S.L, a company established in 2000, registered in the Official Chamber of Commerce in Zaragoza, Spain. The company is wholly owned subsidiary of the Samson AG group of companies and is located in the modern “Empresarium” industrial estate in Zaragoza (Spain). RINGO VALVULAS is a valve manufacturer whose activities include all operations relating to valves, including the design, manufacture, assembly, testing, certification and marketing of the products supplied to a global market. The company has extensive, modern facilities of over 12,000 m2 with state-of-the-art installations and equipment for the assembly, testing and inspection of valves. Ringo Valvulas prides itself in having highly qualified personnel in each and every area. 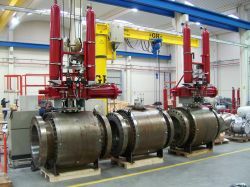 All departments are led by personnel with long experience in the valve business, with an average of over 20 years in the supply of Ball valves (Top Entry, Floating and Trunnion), Control valves, Gate valves, Globe valves, Check valves, Plug valves, Butterfly valves, and many other special valves manufactured and tested to many different design standards, sizes and ratings, with both exotic and standard materials being employed in the extensive product range. Ringo valves are used in a wide kind of applications as refineries, chemical and petrochemical industry, oil and gas upstream, midstream and downstream, offshore, water treatment and energy generation plants (nuclear, fossil, combined cycle and thermosolar). Ringo Valvulas is totally committed to quality, the integration of all departments with the quality assurance and quality control procedures allows us to obtain ISO 9001-2008 by Lloyds register, CE stamp also by Lloyd´s Register, TÜV, API 6D, API 6A, API 6DSS and ASME III N and NPT stamps. Ringo Valvulas policy is also focused on environmental protection and health and safety responsibilities being certified according to ISO 14001 and OHSAS 18001. Our main target is to offer a high quality product and service to ensure the highest degree of satisfaction and fidelity of our customers.